The following excerpt is from Robin William’s book The Non-Design’s Design Book. 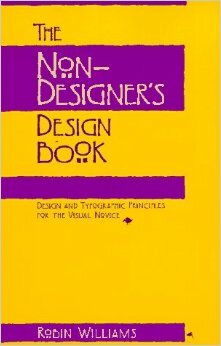 She created one of the best resources for learning basic design. It’s fantastic! Where do you begin when you start to design or re-design something? Start with the focal point. Decide what it is you want readers to see first. Unless you have chosen to create a very concordant design, create your focal point with strong contrasts. Group your information into logical groups; decide on the relationships between these groups. Display those relationships with the closeness (proximity) of the groups. As you arrange the type and graphics on the page, create and maintain strong alignments. If you see a strong edge, such as a photograph or a vertical line, strengthen it with alignments of other text or objects. Create a repetition, or find items that can have a repetitive connection, Use a bold typeface or a rule or a dingbat or a spatial arrangement. Take a look at what is already repeated naturally, and see if it would be appropriate to add more strength to it. Unless you have chosen to create a concordant design, make sure you have strong contrasts that will attract the reader’s eye. Remember contrast is contrast. If everything on the page is big and bold and flashy, then there is no contrast! Whether it is contrasting by being bigger and bolder or by being smaller and lighter, the point is that it is different and so your eye is attracted to it.